What could be better than the tenderness and elegance of dozens of roses? Surround yourself with the fabulous magnificent fragrance of fresh roses all day long with this marvelous Bubble Bath. Mounds of lush rose bubbles enriched with conditioning Glycerin and revitalizing Proline and Glycol await to make you refreshed and relaxed. Infused with the charismatic blend of fascinating Rose and enlivening essential oils, bring harmony and balance of the mind, body and soul. 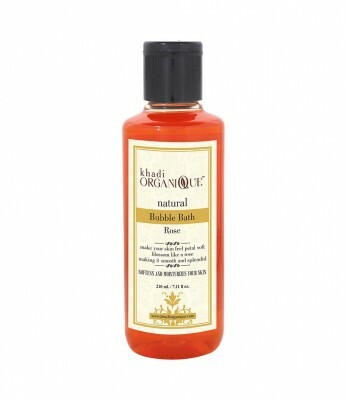 The invigorating, all-natural Bubble Bath of Khadi Organique softens and moisturizes your skin, making it smooth and splendid. Make your skin feel petal soft and glowing with radiance. Take good care of your skin with this outstanding Bubble Bath and blossom like a rose!
" Rose Flower, Basil Oil, Glycerin, Proline, Glycol Experience the sweet fragrance of rose, just like the whispers and passion of true love! "